← Guest Post by Author Cathy Camper: Lowriders in Space Blast Off! Soon, I’m jetting off to New York for the 3rd Annual Comadres y Compadres Writers Conference, held at Medgar Evers College in Brooklyn on Saturday, September 27. Will you join me? It’s going to be fabuloso! It’s not too late to register. Here’s where you can learn more. And now a quick list of seven things I’m looking forward to at the conference. Meeting Latin@ writers, readers, librarians, agents, editors and mover-shakers from all over! Exchanging contact info. Hearing the maravillosa Esmeralda Santiago deliver a keynote! Sharing a lunch table with up-and-coming Latin@ writers, lending encouragement and tips wherever I can. Attending Meg Medina’s craft workshop on children’s books. Learning about the work of other Latin@ writers, because there are always gems waiting to be discovered. 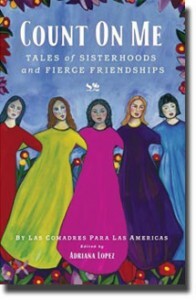 Exchanging abrazos with readers of Latin@s in Kid Lit and meeting Cindy L. Rodriguez, the blog’s founder, at long last! Gathering inspiration for future creative projects and blog posts. Have fun, Lila, at the Comadres & Compadres Writing Conference and maybe give us a summary here about what was going on in the conference in Latino Kid Lit. I see that you are also a panelist. I wonder if a few authors from Latin countries, especially from Mexico, are going to be there. Thanks and have a safe flight. Hi, Giora. Thank you so much! Great idea. I’ll be sure to offer a follow-up with details. Oh what a wonderful compliment! Thank you! Let’s please have a visit at the conference.